I feel that I should preface this review by stating what a big fan I am of the Fantastic Four from the many iterations of the comic book, so my expectations have been high that someone someday will make a live-action Fantastic Four movie that works. Fox’s latest attempt, directed by Josh Trank of Chronicle fame, doesn’t necessarily get things wrong as much as it doesn’t get the things it needs to get right, which is a shame because there are a lot of interesting ideas that probably would have worked well in comic form. That said, it starts in the laziest and least creative way possible showing Reed and Ben as kids, which is something that’s been used by Fox for many of their superhero movies already. It’s a scene used to establish Reed Richards as a super-genius who as a teenager impresses Reg E. Cathey’s Dr. Franklin Storm, who recruits him to work on a project along with his adopted daughter Sue (Kate Mara) and a Latverian hotshot named Victor von Doom (Toby Kebbell). The idea is to teleport to another dimension that can be explored in hopes of fixing some of the problems on Earth, but the government wants to get NASA involved so Reed recruits Ben, Johnny and Victor to take a test run to the dimension that goes horribly wrong. By the time the Fantastic Four finally get their powers, it’s about 45 minutes into the movie, almost halfway done, and that’s where the story falls apart as we jump forward a year and watch the evil government restraining the group and using their powers to do their dirty work while they “look for a cure.” Reed’s only concern is finding Doom, whom everyone else presumes is dead, and when they do find him, he’s gone quite mad from the power he’s gained and he wants vengeance for being left behind. 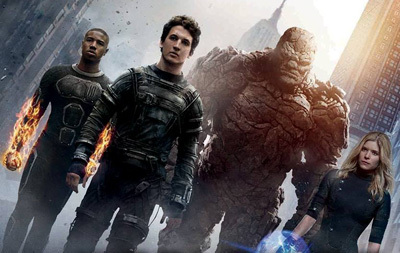 Setting aside the fact that the four main actors range in age from 28 to 32 and are supposed to be quite a bit younger, the cast itself isn’t the problem as Miles Teller works well as Reed Richards and actually all the actors have decent chemistry in the earlier part of the movie. Reg E. Cathy is particularly good as the glue holding things together, and Kebbell does a solid job instilling an arrogance into Doom that’s sorely missed from the dynamics when he disappears after the accident. The second half of the movie is where we start seeing the FF’s powers come to play, and you might think that the progress made with special FX in terms of creating superpowers (even on television! ), Fantastic Four would benefit, but the FX look dated and cheap, the biggest of the problems being Ben Grimm in his Thing form. Trying to integrate Bell’s performance with the character just doesn’t work well, because The Thing is completely lacking in any sort of emotion. When you realize there are animation and FX houses that can create much more realistic CG characters than these—the apes in the “Planet of the Apes” movies, for instance, or Rocket and Groot in last year’s Guardians of the Galaxy—there’s no excuse to have such an awful effort. At times, the Thing looks as bad as the Ang Lee Hulk, and that’s a comparison that’s hard to get out of your mind, especially as things build to a bonkers CG battle between the FF and Doom where the dialogue gets so bad, you wonder if the writers have read anything other than comic books. Basically, it ends up being another origin story with a couple of twists from what’s been done before, but when the FF finally come together, the movie just ends and not in a place where you’re left thinking, “Boy, I really want to see another movie with these Fantastic Four.” That’s a pretty bad thing for a movie that’s hoping to relaunch another franchise. While not nearly the disaster people seem to be expecting or hoping for, Fantastic Four should and could have been better because there was potential in some of its better ideas. Instead, it ends up being a fairly standard superhero movie, which makes one think that maybe the Fantastic Four just aren’t meant for a live-action movie.